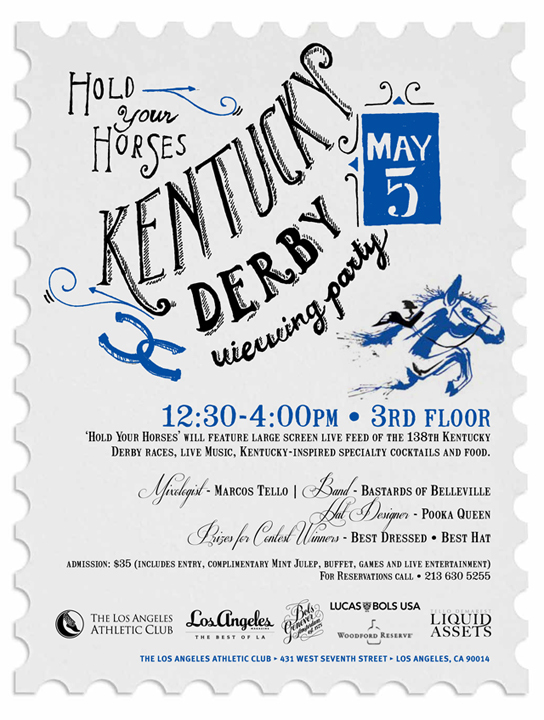 On Saturday, May 5th, the Los Angeles Athletic Club presents its 2nd Annual “Hold Your Horses” Kentucky Derby Viewing Party. Taking place on the LAAC’s newly re-designed 3rd floor, the party will feature the races screening live, onsite betting and equine-inspired games. Hat designer Pooka Queen will be showcasing her original creations, and live bluegrass will be performed by the Bastards of Belleville. Included in the ticket price is a Kentucky Derby-inspired buffet, featuring: assorted canapés, pulled pork sandwiches, Kentucky hot brown sandwiches, garlic truffle fries, bourbon glazed chicken wings and shrimp and corn fritters. Dessert will include pecan tarts and cream cheese and chocolate fudge brownies. Following the event, guests can use their “Hold Your Horses” ticket stub for a complimentary cocktail at Seven Grand. To purchase tickets, please call (213) 630-5255.